I'm a lantern collector but have a few military odds and ends. I acquired this lantern a little while back and it's rather odd compared to others I have. It was made by the E.T. Wright & Co. Mfg. Co. Of Hamilton Ontario. They were the biggest lantern manufacturer in Canada and operated between 1883 and 1930ish when they merged into GSW. This particular lantern is a No.4 Cold blast, the staple of ETWs lanterns and this model dates to the mid to late teens into the 20s. What is odd however is the lantern is coated in a dark green Japan or paint, unlike any I've seen before. Its fading of course but still evident, its clearly original as every part is evenly coating in it, a result you couldn't get by hand painting after production. What is also note worthy is the globe is unique as well. This one says made in Canada along the top of the globe. Later made in Canada globes used in beacon lanterns have it about midway down the globe and a much thicker font than what is on this globe. Interestingly I just saw a seller on kijiji selling another one of these identical lanterns with the same green colour and different made in Canada globe. 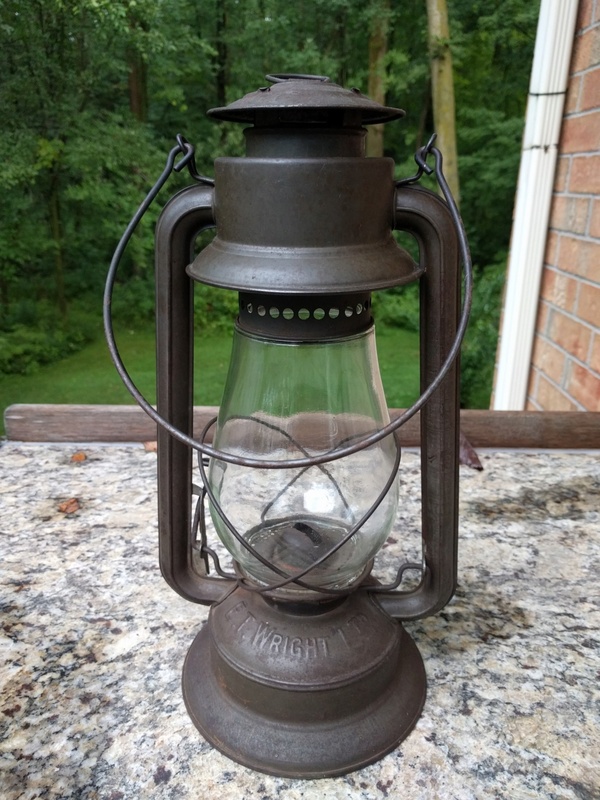 Could this be a Canadian military lantern? 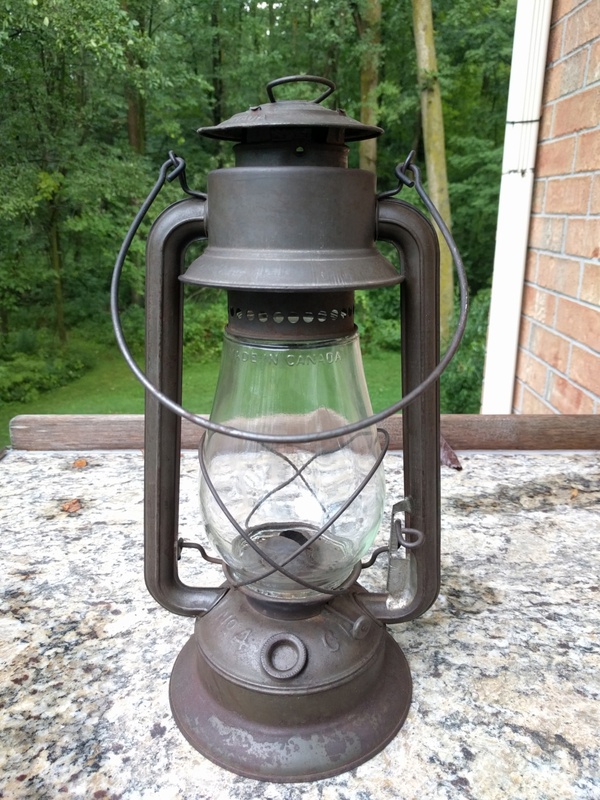 I bought this from a local lady, her father served in ww1 and stayed in the military until the 30s I believe is what she told me, so he was in the military at the correct time period for this lantern too. I have also found a record online, I'll have to look it up again, but it was a contract released by the Canadian military for a lantern manufacturer to make them lanterns, E.T. Wright was the only manufacturer to submit a tender. So I know ETW made Canadian military lanterns, just don't know what they look like yet. Does anyone else have Military lanterns? I know American military lanterns are marked as such or used special modified lanterns so they're easy to detect, Canada on the other hand I don't know. There are about 20 or so military lanterns hanging in the upstairs of an old surplus store that I have been into lately. The owner mentioned there were two sizes of them up there. Unfortunately, the second floor is caving in so I am not able to access the lanterns at this time. Winter has set in, but I'll have a look next spring and figure a way to get them out. There are several on the main floor, but they are primarily "beacon" marked.